Have a favorite book published in 2011 that happens to be written by an LDS author? Have more than one? Awesome! Nominate them for a Whitney Award! The Whitney Awards are annual awards given to LDS authors for their fiction books published within that year. The awards were conceived by awesomesauce author Robison Wells (Variant, see post here) in 2007 and have now become a great celebration of LDS writers. There is even a special banquet/gala hosted each year in connection with the LDStory Makers conference to announce and honor the Whitney winners. 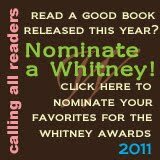 The Whitneys are an awards program for novels by LDS authors. Elder Orson F. Whitney, an early apostle in the LDS church, prophesied “We will yet have Miltons and Shakespeares of our own.” Since we have that as our goal, we feel that we should also honor those authors who excel and continually raise the bar. The Whitney Awards honor novels in the following categories: General Fiction, Romance, Suspense/Mystery, Speculative Fiction, Youth Fiction, Historical, Best Novel of the Year, and Best Novel by a New Author. Novels can be nominated by any reader (via this website or by mail), and nominees are voted on by an academy of industry professionals, including authors, publishers, bookstore owners, distributors, critics, and others. The awards were founded in 2007 and operate as an semi-autonomous subsidiary of LDStorymakers. *For more information about the Whitney's please visit author Annette Lyon's post from earlier this year, and author Tristi Pinkston's more recent post. WHAT ARE THE 2011 BOOKS BY LDS AUTHORS THAT YOU HAVE LOVED? What about The Cheshire Cheese Cat: A Dickens of a Tale by Carmen Agra Deedy (not LDS) and Randall Wright (LDS). Is it eligible even though it was half-written by a non-lds person? Or is it only half eligible? Er... It may not be 50,000 words long. Ah, well. Er... again. Reading further in the rules, I see that for youth fiction the novel must be at least 20,000 words. So I repeat, "Is it eligible?" I hope you get this comment! And I'm sorry that The Cheshire Cheese Cat isn't eligible. But I'd like to feature it on this blog at some point! Are you the co-author Randall Wright by any chance?